We’d love your help. 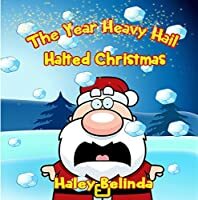 Let us know what’s wrong with this preview of The Year Heavy Hail Halted Christmas by Haley Belinda. Enjoy Advent this year with a cute Christmas storybook for your Kid's! The Year Heavy Hail Halted Christmas. A funny Christmas story! What will Santa and the Elves do when a freak storm interrupts the children visiting him? Having modern methods, will it be the reindeer with their red boots? Who saves the day! Join Ellie and Abby as the school closes, and they get ready for Christmas. 3000 words, an excellent read every bedtime up to and on Christmas Day! The Year Heavy Hail Halted Christmas for your child this holiday season. A Wonderful Christmas Storybook! To ask other readers questions about The Year Heavy Hail Halted Christmas, please sign up. This is a lovely story for children to read this time of year with lots of wonderfully colorful pictures. The main themes revolve around the anticipation of Christmas as a child, having a best friend, the possibility of Christmas being cancelled due to a hailstorm (the horror) and some exciting futuristic developments that gets the imagination going, told with a heartwarming and sweet tone. The story made me smile many times as I was reading it, remembering what it was like as a kid during Christ This is a lovely story for children to read this time of year with lots of wonderfully colorful pictures. The main themes revolve around the anticipation of Christmas as a child, having a best friend, the possibility of Christmas being cancelled due to a hailstorm (the horror) and some exciting futuristic developments that gets the imagination going, told with a heartwarming and sweet tone. The story made me smile many times as I was reading it, remembering what it was like as a kid during Christmas, so I think that parents will enjoy reading this with their kids as much as the children will. Reading for children is so important; it creates a strong bond between kids and parents and develops the children’s imagination, so I can really recommend that you read this with your kids for Christmas, it will put a smile on your entire family's face.